Good quality Card, is the base for all your creations. This is the main base to all your creations. When you buy it, it is measured in Weight and the term "GSM" is commonly used for UK weights, which means grams per square metre. The picture is a very small display of the thousands that are there to buy. 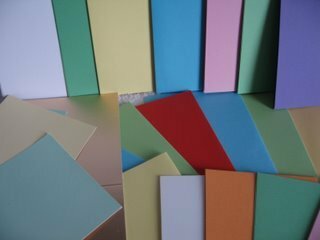 It is available in many different finishes, such as hammered, linen effect, embossed, coated, pearlised and many more, and each will give a different result to your cardmaking. And don't forget the Specialised varieties that can be made into toppers. Matting and Layering, is simply layering card or paper together to form a narrow frame around the image to be used as the base of your creation. You can buy it ready folded as blanks. These are usually sold in packs and come complete with the envelopes. You can get these blanks already shaped, (handbags, castles, shoes, cats, butterflies etc.) then all you need to do is add the embellishments of your choice. But you may choose to buy the sheets and cut and fold it your self. This is probably the best option if you have a lot to make, and often works out a lot cheaper. When you are new to this hobby it can be a little confusing trying to work out the sizes. This will explain them to you in an easy to understand format. Most people are familiar with this sizes as it is the size of the copier paper that you will use in your printer. I hope these will help you to understand the sizing and to help you further you could buy a metal ruler with both centimetres and inches on it. A useful piece of equipment to enable you to get a really professional crease is the Scoring Board. This will give you a really good finish and you will find that the card has a slight overhang on one side. This is called the "leading edge" and it enables the finished piece to be opened easily, and the largest side should be to the front. Once you are more confident then have a try at doing some of the different folds. Take a look at the Basic Folds Tutorial to help you get started.